One of my favorite gardens in Seattle is the Witt Winter Garden in the Washington Park Arboretum. It is a wonderful feast for both eyes and nose. Even on a rainy day it can brighten your spirit and inspire you. It is located just across from the Graham Visitor’s Center. The parking lot at the visitor’s center is very convenient for the garden. There is a sign with a list of what is in bloom. Definitely check out the plants around the visitor center. There is a stunning Viburnum X bodnantense on the south side and it was in full bloom. The path winds up through low growing winter jasmine which unfortunately have no scent. We saw a smattering of crocuses with their gaudy purple sticking their heads up through the undergrowth. At the top of the path is a nice planting of Crape Myrtle. The mottled looking bark is striking on the drizzly day. There are a few early azaleas also in bloom. But our noses lead us on. 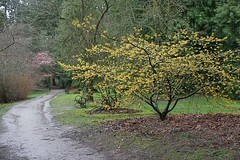 The witch hazel is in full bloom along the path to the left. I love their spicy perfume. And their wispy spiral flowers that look like little bows on the branches. 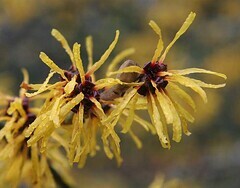 The yellow Hamamelis mollis has a lovely scent. The red flowered trees are more spicy but the yellow has the best perfume. The witchhazel is definitely the star of the garden but looking closely you can see many other winter gems. Underneath some of the trees are Helleborus orientalis in shades of pink and purple. The silky tassles of a Garrya brings a festive look to the dark green leaves. In addition to th Crape Myrtle trees, there are several other good examples of plants with interesting bark; the yellow bark of Cornus alba contrast nicely with clumbs of black mondo grass. Nearby is a nice grouping of two trees with interesting bark; the Himalayan birches Betula utilis var jacquemontii and paperbark maples, Acer griseum. Bringing more scent to the trail are Wintersweet Chimonanthus praecox, winter honeysuckle Lonicera Fragrantissima and Sarcococca ruscifolia. On a dreary day, the smell and color reminds us that spring is not far.